You might remember the depth of the the holes that we dug. Thankfully we didn’t have to fill up the entire hole with concrete. But, we did need to give the concrete blocks (aka the footings) something stable to sit on. Our next mission, therefore, was to fill up the pits to the correct depth, so that we had a stable platform on which to cast the footings. We purchased some more G5, hired some strong young men in need of work, and got ready for the job at hand. Filling the pits was a slow and laborious process. We used G5 to fill up the holes, after which we compacted the layers with a Jumping Jack Compactor. We had to compact every 15cm in order to ensure that each layer was compacted sufficiently. If we did not do so, we would run the risk of not having well-compacted layers. This would result in our house sinking over time as the G5 settles with the weight of the house above it. When the layers reached close to the desired height, we continuously checked the depth of the holes with a dumpy level, until it was perfect. It took about three full days of hard work to complete the work to this stage. In a standard house, the Swartland Municipality would pay us a site visit to check on the trenches dug for the foundation of the house at this stage. As our situation is a little different, it was difficult to judge exactly at what point they would want to see the progress – full depth or filled up to casting level. However, we’ve taken many more photos of the work completed and have submitted the form to request a site visit. 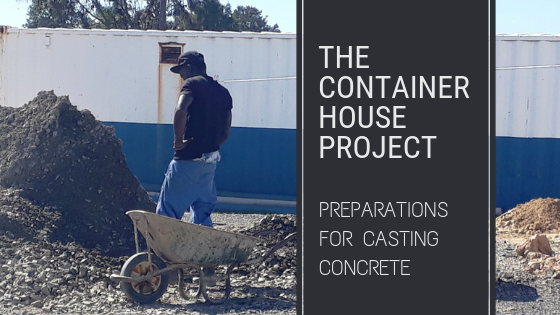 Next post: Casting the Concrete Footings! It must be very reassuring to fill in the holes and compact the sand yourselves, or at least to see it being done with your own eyes, so that you know exactly what is under you once you’re in the house and are sure that it won’t budge. Great work! Yes that is a good feeling!